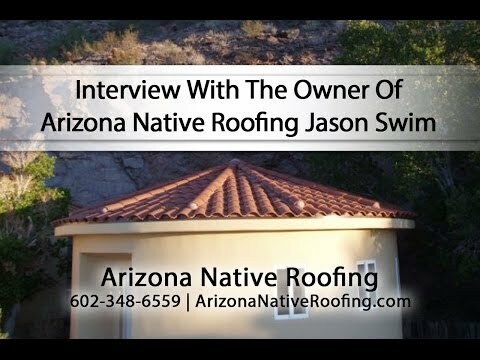 Arizona Native Roofing LLC is owned and operated by a local family right here in Arizona. We founded this company on the basis of integrity and honest service from the eyes of a professional roofer, not a salesman. We keep our company small and treat your roof like our own. All journeyman Phoenix AZ roofing contractors with Arizona Native Roofing have at minimum of 12 years experience in the roofing industry in Arizona. We provide generous roofing warranties to each of our clients. Whether you are receiving roofing services for roof repairs, foam roofing, or a full tile roof replacement on your Phoenix home, we ensure that your home is taken care of for years to come. If you are looking for a company who will give you the quickest fix or cheapest deal, you have probably called the wrong number. We truly take pride in our work and the quality of materials we use. Our Arizona roofing company still considers a handshake a bond of our commitment to fixing your roof right. Thank you for considering our Scottsdale roofing company for your next Arizona roofing project. Our experienced roofing team specializes in both residential and commercial roofing. Whether you are in need of a reliable and trustworthy commercial roofing company to provide you with ongoing preventative maintenance, or your home’s roof needs repairs, we have you covered. We are in good standing with the Registrar of Contractors in the state of Arizona. You can also check out our customer testimonials page for more insight on our company reputation. If you are looking for additional resources, references are available upon request.